I visited Prince Bokka the Magnificent only a few hours ago by invitation to see a play about Prince Rurik’s life. I didn’t find out until it was about to start that Kournans were playing all of the parts. Needless to say, it was a trap meant to kill the prince and myself. I equipped my bow the moment they turned aggressive and planted an arrow in Vaughn the Venerable’s chest before he could harm any of the nobles. My group of friends and henchmen took care of the rest. I am disappointed in Varesh’s ability to gain the prince’s trust in at least getting rid of the sunspears. Now she has to deal with two nations! This has already been a busy day, but I managed to get two of my friends to help me explore the area better. I’m sure that Rajas and Elwin are more interested in meeting the prince when we’re done. Not that making our enemies explode with elementalist magic is a bore. As we walked outside of the Honur Hill gates, we noticed Prince Bokka’s palace. 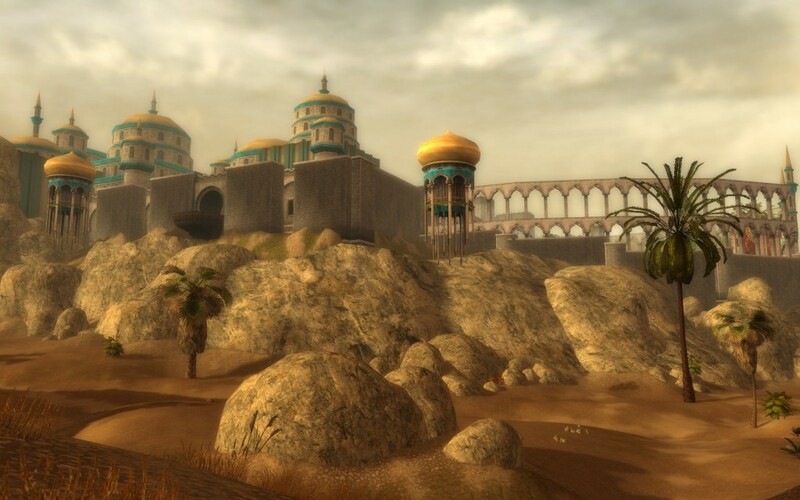 I’ve made a lot of money during my travels, but I can’t imagine having enough to build my own palace. Our eastern path took us to a large cave, where we found a small apartment. I wondered who would want to live down here amongst the djinn. I watched Kormab, the Burning Heart from afar. Unfortunately it spotted us and attacked immediately. I sensed that these elemental creatures are very protective about their territory. 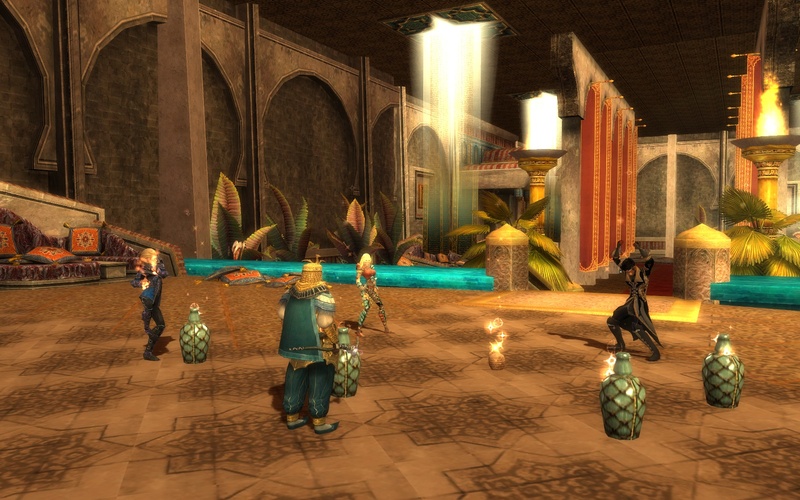 It saddens me to kill the djinn but they won’t stop attacking us until we do so. I’d much rather prefer to have them as allies. 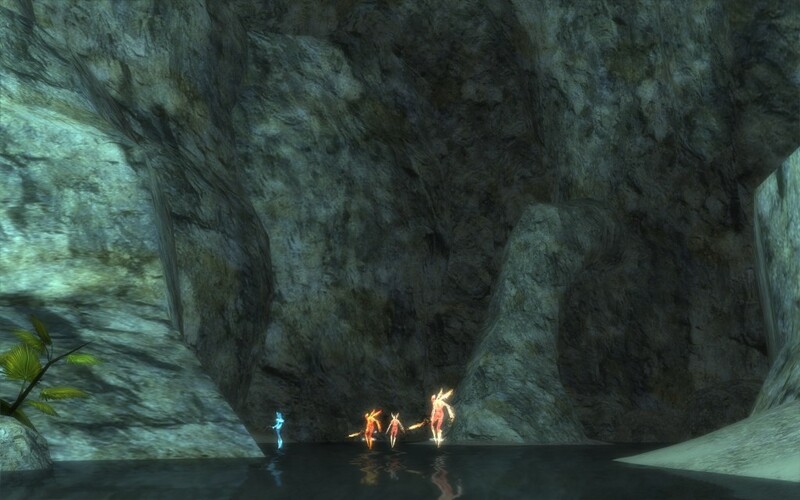 Leaving the eastern caves, we encountered a lot of skree harpies as we headed westward. One of their leaders, Bansheh Gatherer of Branches was found near the edge of Resplendent Makuun. After the battle, we stood on the rocky edge and looked out into the unknown. 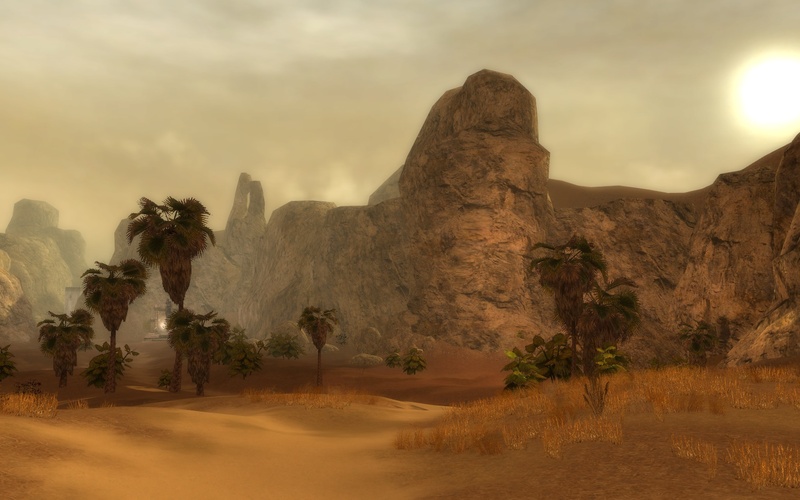 Even though Rajas is native to Elona, he does not know what lies beyond here. 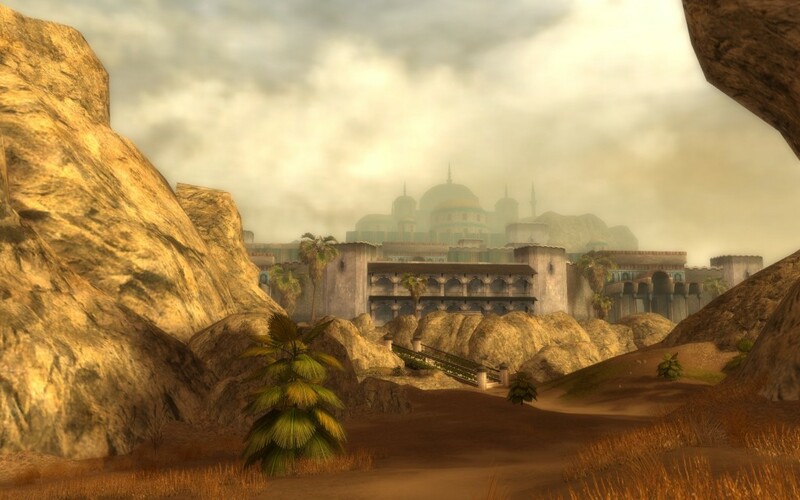 With the exploration of the area complete, we headed back to Prince Bokka’s palace. 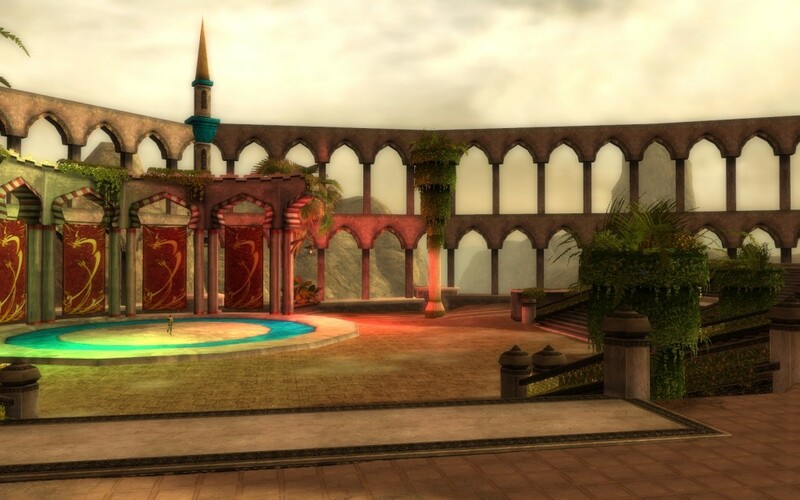 On the west side of the palace, I spotted a balcony and the Bokka Amphitheatre. Inside the palace there are a few statues and large tapestries. 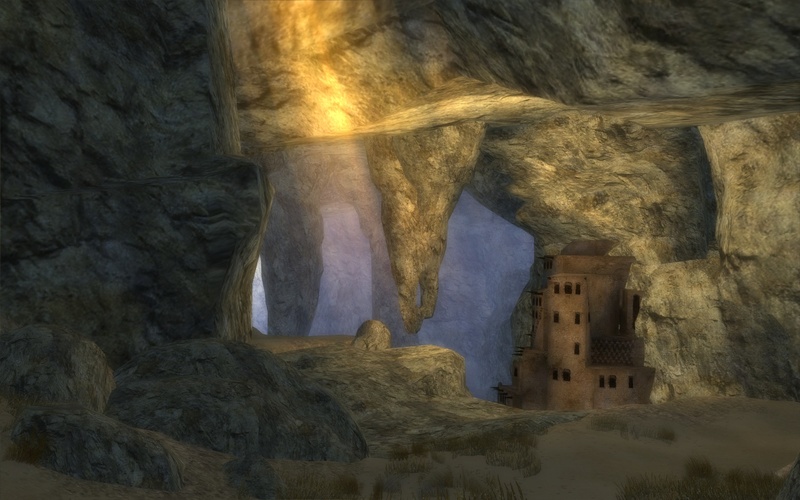 What caught my attention was the tapestry of a dragon, which I have also seen in the city of Old Ascalon. 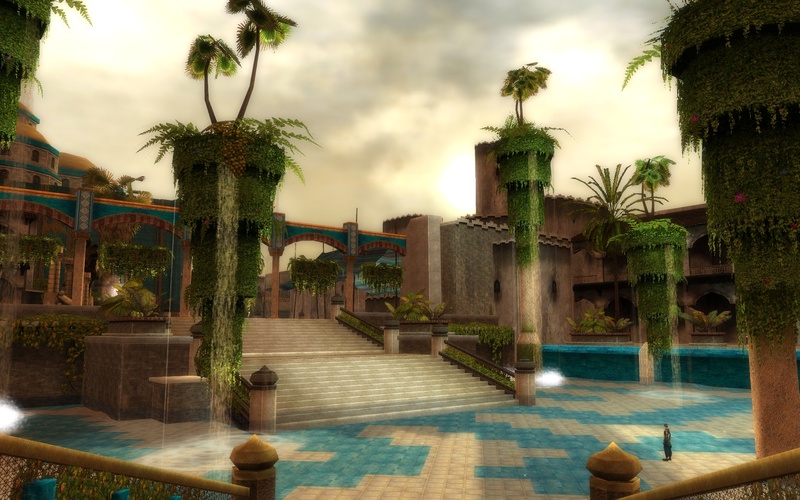 A sizeable portion of the palace is dedicated to hanging gardens and a shallow pool of water. I wondered if it was actually used for any events, or if its purpose is merely for decoration. 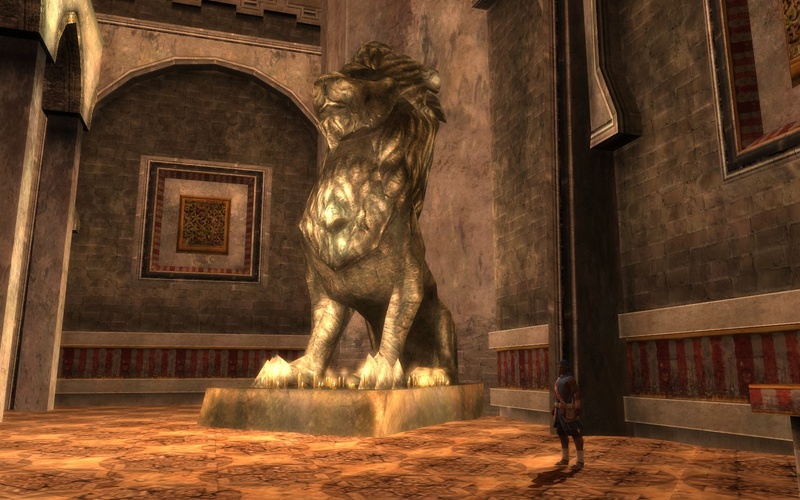 Near the entrance to the Bokka Amphitheatre and the throne room, I spotted a statue of a lion. 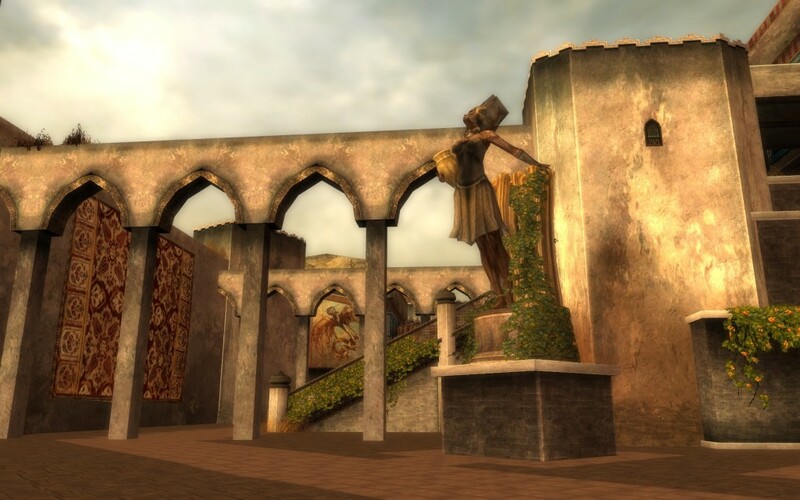 Except for a few candles on the lion’s platform, it looks exactly like the statues in Lion’s Arch. Is Prince Bokka a fan of Tyrian statues and tapestries? Being a Canthan, I am pretty disappointed that he doesn’t have a greater appreciation of the Dragon Empire’s creations. If Prince Bokka is a patron of the arts, something from the Kurzicks would fit right in here! Norgu drew our attention to the amphitheatre so he could put on a little show for us. We had to kindly decline his offer when it turned out to be an interpretive dance. Elwin, Rajas and I met up with Prince Bokka to drink and party the night away. Goren, Prince Bokka’s body guard, wanted to join the festivities, but the prince would not permit it. It wasn’t long before I told the prince of my epic journey through Tyria’s lands, but in hindsight I’m sure it didn’t sound very impressive because I was quite drunk! Friends: Rajas I., Elwin L.